I think I’m probably a bit of both. I love to try new things, take on new ideas but I think I like to see them in action first. Does that make me a follower? What about you? Do you like to lead the way and set the trend? If you apply this to your kitchen do you like to add your own take on a trend? Do you add your own tastes and really mix it up? A little while ago when I wrote about designing your ideal kitchen it struck me that not all people would like this kind of thing. Many people are confident enough to design their own individual look and often don’t want the ideal fitted design. Many people would like to create something individual that fitted units can’t always give us. 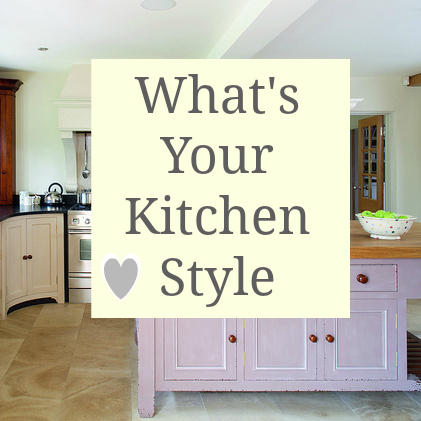 So would you buy a fitted kitchen or do you like freestanding kitchen units? IKEA as ever, has a great range of Standalone units which you can put together to fit your space and design ideas. The cost is good too and the Scandinavian design doesn’t seem to be dating at all. They look great in either modern, contemporary homes or suit the country cottage look too. If you have mixed, eclectic tastes this style is probably one for you. It lends itself to being quirky and unique, allowing you to be really extravagant with your ideas. Take this shot of a very eclectic kitchen; it’s not my thing, but I actually quite love its vibrancy and personality! Building your own design and take on a style takes confidence, but that doesn’t mean you have to shy away from it. Part of what I love about this blog and writing about home interiors is that I hope to inspire people along the way. I want to give people the idea that they can have a go at designing and styling their homes. That it’s ok to make mistakes (we’ve all done that) and that our homes are a true reflection of us, and so there’s no right or wrong way. It’s about what makes your house your home. So whether you’re a trend setter or a follower of fashion, does it really matter? Have fun with your kitchen, and home style. Play around with it and inject some personality into your creation. Choose a fitted kitchen or go for freestanding units, do what you feel is right and follow your instincts. Your home interior choices will be better for it! Sounds fabulous and I don’t think you need to ‘be able to design anything’ – it’s good to just follow your instincts. Wow, a couple of range cookers eh? I assume you like to cook?? !